As much as we may hate to admit it, dogs age just like we do. With age comes an increasing number of health concerns, including cognitive dysfunction. Cognitive dysfunction in dogs is a neurodegenerative disorder of senior dogs and cats that involves the gradual decline of a number of intellectual functions. Laboratory tests (which we'll discuss in a moment) show that senior dogs with cognitive dysfunctions perform poorly in tasks that involve discrimination, attention, and spatial memory when they are compared to younger animals. After 8 years of age 14-60% of dogs will experience cognitive dysfunctions. Like many disorders, early recognition and intervention is the key to prolonging the quality of life of your dog. During visits to a vet, we are very likely only going to report serious changes in behavior that we notice. All of the subtle signs often go unreported. These subtle signs can be crucial indicators of declining health or cognition. It’s extremely important that family members identify and report changes from normal behavior to their veterinarian, but often people don’t know what to look for. Cognitive dysfunction in dogs is difficult to identify, but with the help of your veterinarian it is possible. Early identification is crucial, because it provides the opportunity for intervention so that the quality of life of your dog is maintained as long as possible. Signs of cognitive dysfunction in a dog typically show up as canine ages. However, there are other reasons that your dog may be exhibiting these signs. It's best for you to understand the signs of cognitive dysfunction and what you should do if you notice them. 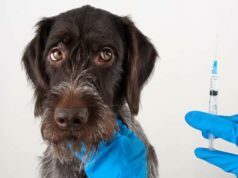 These signs are all concerning on their own, but if you happen to notice multiple symptoms happening at the same time, you need to bring your dog to seek veterinary help immediately and perform some tests. Also, it would be a good idea to begin keeping a journal when you start to notice any signs of cognitive dysfunction in your pet. Let's say your dog has a short bout of confusion one afternoon. If you record the instance and how long it seemed to occur, it will be easier to track the symptoms. Not only will you be able to easily track if the symptoms are getting worse, but it will also make it much easier to explain the signs that you're seeing to your veterinarian. This can look different in different dogs. But, generally, it will appear as though your pet is disoriented in an area where they would generally be quite familiar (e.g. your yard or house). Changes in how your dog interacts with other pets or people can come in the form of general disinterest or in worse cases increased aggression. Your dog may change its attitude towards things that used to elicit excitement, for example taking the leash out of the closet to go for a walk, or become relatively apathetic toward things that used to frighten them, like thunder or loud noises. You should keep an eye out for signs of increased anxiety, pacing and other repetitive behaviours, such as excessive barking. Some dogs with cognitive dysfunction disorder have been observed to have a reversed day-night cycle where they spend most of the day sleeping but become quite active during the night hours. Deficits in learning and memory can appear as house soiling or as diminished ability to work, perform tasks, or take commands. The latter are quite difficult to identify, except for those pets that are trained for a high level of performance or are trained to perform a particular job. What to Do if You Begin to Recognize These Signs? If you start to consistently see these signs in your dog, the first step is a trip to see your veterinarian. They are going to ask questions and perform examinations in order to rule out medical problems, like pain, hearing, or sight loss that could be contributing to changes in behavior. Your vet will also collect information about any changes in your dog’s schedule or household that may be contributing to these symptoms. From there, your vet may recommend changes in diet and/or prescribe drugs or supplements that are meant to improve symptoms and slow the progress of cognitive decline. There are a few things that you can do at home to help a dog suffering with cognitive dysfunction as well. It's likely that your veterinarian will recommend these things, but if not be sure you speak with them about adding these things into your pooch's daily routine. It’s not only good for you, but it is good for your dog too. Exercise has been shown to improve learning and diminish the risk of developing cognitive impairment with age. It has also been shown to be particularly effective in reducing impairment that has already occurred with age. Do be mindful of your dogs advancing years and medical problems that have been identified by the veterinarian. Osteoarthritis is a common condition with aging animals. Keep the walks short and try not to over do it, find new activities that provide exercise, like tug toys or hide and seek. It’s also good to avoid activities that involve sudden changes in direction as these can put your dog at a higher risk of injury. You know how good it feels to sit down and watch a movie, play the piano, or read a book? These things that we do fall into a category called environmental enrichment. This is what a new dog toy is to your dog. Having something new in their environment increases its complexity and has been shown to have beneficial effects on learning and reducing age-dependent decreases in cognitive functioning. Toys for dogs serve more than the purpose of entertainment, and are an essential tool that every pet owner must have in their arsenal. In fact, one study even showed that the combination of regular exercise and new dog toys, especially puzzle and interactive dog toys, given to beagles was even more effective in reversing cognitive dysfunction with aging than either one alone. Routine won’t reverse cognitive decline. But, it can help manage some of the symptoms. Predictability, along with providing your pet with the control to participate in pleasurable activities and avoid unpleasant ones may be helpful in reducing some feelings like fear and anxiety that can accompany cognitive dysfunction. This applies to the age old adage, “use it, or lose it.” Performing reward training, which challenges them to use their memory, and getting them food manipulation toys or chew toys engage and provide your dog with another form of stimulation that can help slow the process of cognitive decline. As their abilities decline, it can become increasingly difficult to navigate their way around the house. Adding new odor, physical, or sound cues around the house could help them navigate better and decrease feelings of fear and anxiety. If their ability to move or their urinary control is also affected, more frequent trips outdoors, a dog walker, or an indoor elimination area may become useful. Dogs today have access to better veterinary care, nutrition, and veterinary guidance. This means they are living longer and longer. This is great, but it comes with new medical challenges for dogs and owners. The first step is education, and there are many ways pet owners can prolong the lifespan on their dogs and increase quality of life for senior pets. Recognizing the early behavioral changes that could suggest cognitive dysfunction in the dog is the key to ensuring your best friend is going to have the longest, happiest life they possibly can.